We’ve discussed the many merits of design thinking, and now it’s time to get started on your very own design thinking session. Doing this for the first time can be daunting, especially if staff is not yet on board with the process. We’ve collected some practical tips for running a successful brainstorming session, which will give birth to new and innovative ideas. Turn off all distractions, including phones, tablets and computers. Let everyone know that in this meeting there is no multi-tasking. Everyone’s full attention must be focused on the brainstorming. Explain – and explain again – what the purpose of the session is. Ask everyone present to give it their best shot and be dialed into the solutions suggested no matter what their official job title is. Let staff know that not being creative – or not being strategic – is not an excuse for checking out. Stress that a successful design thinking session requires the melding of these two strengths, and that each participant brings his or her positive qualities to the table. Give everyone a chance to voice their thoughts. Although this may lengthen the meeting considerably, making every person in the room a part of the process is crucial. You never know where the best ideas will come from. Also, hearing each person makes it easier to divide the staff into smaller groups later on. Don’t judge or let anyone else judge any ideas. Even the silliest-sounding ideas may eventually lead to a breakthrough. And you want staff members to feel that this a safe place to express themselves, so no one keeps quiet out of fear of ridicule. You could miss the best idea if someone is too shy to speak up. The leader of the session should give the floor to others as much as possible. Design thinking is not about keeping control in the hands of the boss. Instead, it’s about opening the floor to everyone so that different perspectives can be heard and melded into one brilliant idea. Someone should be taking notes so you don’t lose all the innovative suggestions made in the session. But tracking progress should be done as unobtrusively as possible, so that it doesn’t interfere with the free thinking of the group. Note which staff members are not participating actively. They probably think that due to their job title they have nothing to contribute to the session. Encourage them by asking for their opinion directly or have them work in a group where they won’t be overshadowed. Toward the end of the meeting, start narrowing down the ideas by usefulness and feasibility (while not dismissing any ideas in a hurtful way). Make final selections of which ideas to pursue further. After the meeting is over, celebrate its success by highlighting what great ideas came out of it and how they will save the company time and money or provide the customer with a much improved product. Let participants know that their contribution was important and that you look forward to their help in the next design thinking session. 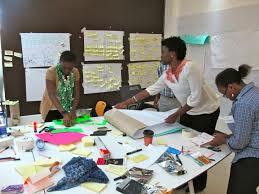 Triode team includes certified facilitators in Design Thinking that can support you in your efforts. They will host several workshops in the coming weeks.